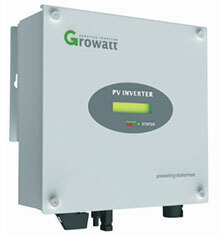 We repair and service Growatt inverters! If you’re in need of Growatt inverter repairs or servicing, call Service My Solar to have our qualified technicians get your system back up and running. If your inverter isn’t on that list, contact our solar experts to find out how we can assist you. No AC Connection: make sure your solar supply main switch hasn’t tripped, and turn it on if need be. AC V Outrange: the voltage of the grid is possibly outside the inverter parameters, which will work again once it is back in range. If this error is on often, check the quality of your electricity with your provider in order to make sure your voltage remains under 255 V.
Error 117: this fault code indicates a relay issue; it means that the inverter needs to be replaced. Any other “Error” message might be fixed by resetting the system. If this doesn’t work, it is likely that your inverter will need a replacement. If it is still under warranty, you will be asked to provide photos of the unit’s screen showing the error message and serial details. If the inverter is no longer covered by warranty, you will have to replace the unit. Growatt solar inverters are complex so it is important that they are repaired by Clean Energy Council accredited electricians. Service My Solar uses a comprehensive Growatt inverter service procedure to make sure your inverter is fixed rapidly, well and in the most affordable way. Most of the time, our qualified staff visit your property, check your inverter, order replacement parts from the manufacturer, and either fix the defective parts or suggest a new model if it is more cost effective. In any case, they’ll undertake all necessary performance and safety tests before they sign off your equipment and return it to duty. Service My Solar guarantees quality repairs due to its high safety and labour standards, as well as low prices thanks to its Australia-wide coverage and strong manufacturer relations. Service My Solar is a highly-trusted Australian solar energy leader, delivering premium accessible solar energy solutions nationally. With a wide and solid office network, Service My Solar’s team thrives to assist Aussies in their solar journey. To talk to one of our solar experts about Growatt inverter repairs, call Service My Solar on 1300 496 278. Alternatively, you can request a service online by filling out the enquiry form below.